I'm going to take a break from the postings about the tragic events, and my usual badgering about buying my books to talk about sports. Recent followers of this blog are probably unsure of what I'm talking about, but long time followers probably know I'm a huge cycling fan, and there's nothing bigger in cycling than the Tour de France, which ended on Sunday. This year was a good race, but not for the normal reasons. This year the every day stages were very exciting, and the competition for some of the "lesser" jerseys was also quite exciting, but the competition for the overall yellow jersey was actually pretty boring. I've been following cycling for almost 30 years, and I'd have to say that Bradley Wiggins was quite possibly the most boring winner I've ever seen. Don't get me wrong, he deserved to win, and he and his team rode a great race, but there were none of the attacks of Hinault, LeMond, or Armstrong. He just let his team do everything for him, and no one seemed to be able to do anything about it, which made the race for the yellow jersey kind of boring. Even with his teammate challenging him from second place, we didn't get any of the drama that we saw from the LeMond, Hinault battles. So, yeah, a boring, but well deserved victory for Wiggins. It was nice to see Peter Sagan take the race by storm, and as Coloradoan, it was great to see Tejay Vangarderan win the white jersey as best young rider. At 23, the guy showed a lot of class when he was asked what he'd be thinking about when they reached Paris, and instead of any of the pat answers most athletes would give, he responded by saying that he'd be thinking about the victims of the Colorado shooting. Rebecca and I have just returned from the vigil for the victims of the theater massacre. It was the first time I'd ever attended something like this, so I wasn't sure what to expect, but it did seem to have a healing effect, even if I'm not one for prayer. One thing I did while I was there, was I took a lot of time to look at other people that were there. It was a diverse group, cutting across all racial groups, all ages, and all religions. I'm pretty sure I wasn't the only atheist there, but for me it wasn't about the prayer, it was about being with people that might be feeling some of the things I'm feeling. I think the most touching moment happened even before the event began. There were several naval members standing behind us, obviously friends of one of the victims. A member of Aurora SWAT was walking down the sidewalk, and he cut across the grass, walking at least 40 feet to shake their hands and tell them he was sorry for their loss. This was a guy who was probably on the scene at the theater, and he still felt like he had to say something. When the families came out there was of course a huge round of applause to support them. Several of them waved at the crowd to acknowledge the support, even as they cried. Next to the military and the families, Gov. Hickenlooper got the biggest round of applause when he said he wouldn't refer to the shooter by name, but would call him Suspect A. This is how it should be. This guy doesn't need to be known. His name needs to be erased from history, and we need to only remember the victims. I have to admit that I'm not necessarily a big supporter of President Obama, but he was in town just before the vigil, and rather than going for the cheap political opportunity of showing up at the vigil, he instead chose not to. He met with the families beforehand, and then left. I think he deserves big props for that. For those of you not in the area, you might not know that both candidates have pulled all of their political ads for a few days, seeing that it's not the right time for these things. By now, just about everyone has added their comments to the web about what happened here in Aurora early Friday morning, but I feel I need to comment on it as well. Colorado has seen it's share of tragedies, with school shootings and fires, but this one is so much more intense for us. Part of it, I'm sure, is because Rebecca and I are both a lot more emotional about crimes committed with guns after she had one pulled on her earlier this year, but it's more than that. This horrible tragedy happened at our theater. Rebecca and I had our first date at this theater, and we've seen a lot of movies there...possibly even in the theater where this happened. When I stand on our balcony and look up the hillside, I can see the sign for this theater. This was almost literally in our backyard. I majored in psychology in college, but I can't even begin to fathom what was going on in this guy's mind to think this was the "right" thing to do. Understanding criminal insanity is often hard, but as a writer, I've learned to put myself into a criminal's mind and try to come up with reasons for why they do the things they do, but I'm stumped on this one. I really just don't understand. Worst of all, before bed last night, our seven year old started crying, saying that she was worried that someone was going to come in and kill us during the night. This guy has hurt so many people, and I'm certainly hoping there will be justice. 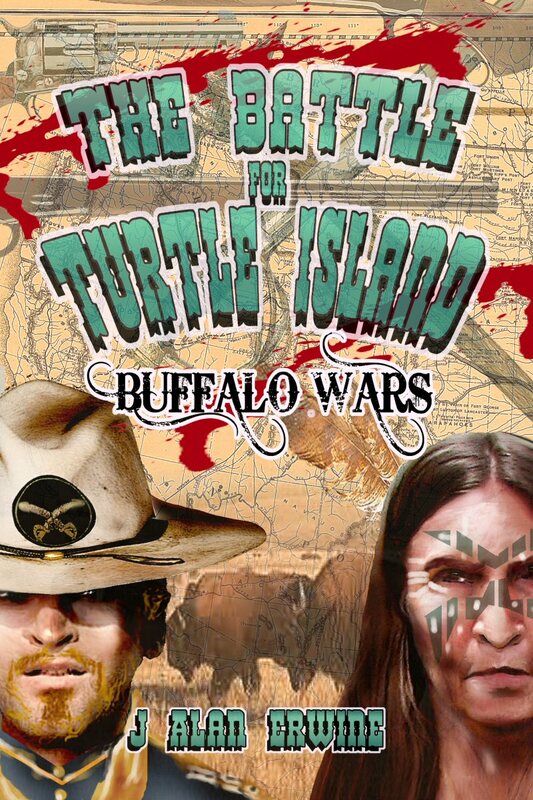 We've officially kicked off the fund raising for the new game The Battle for Turtle Island: Buffalo Wars through Kickstarter. 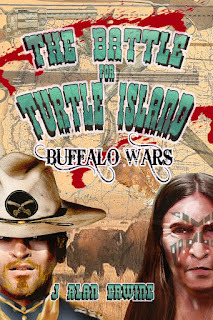 Simply go to http://www.kickstarter.com/projects/1521750492/the-battle-for-turtle-island-buffalo-wars, and you can donate whatever amount you'd like. There are certain donation levels that will get you PDF copies of the game, or print copies once it's released, and for the really big spenders, there are some really great rewards. So, please help launch this new game. I think, in my oh so humble opinion, that it will be a lot of fun for players, and I'd really like to make it as big of a debut as I can. This entry is geared more towards readers than writers and editors, but I think most writers and editors would agree with what I have to say. When a reader finishes a book, the most important thing they can do (especially if they liked it) is go to Amazon, or any other site, and review the book. Reader reviews do more to help a new book than any promotion, especially with small press titles. With large presses, a new book might have a couple of months to gain a following, but in the small press, the time is much shorter, and all small press writers are dependent upon people reviewing our work. Sometimes even a bad review can help, but obviously we prefer the good reviews. If a potential reader can read a well thought out review from an objective reader, they're much more likely to take a chance on a small press book. Most readers assume that if it's small press, the author must not be very good, but this isn't always the case, and a well thought out review can convince them to buy the book. I think it's also important to actually review the book...not just rate it. Giving a book a star rating without saying anything about it doesn't really help...especially one and five star ratings because that just makes other readers think that someone was either being a prick (one star rating) or is a friend of the author (five star rating). Some of you have been following the story of Rebecca getting robbed at work, and all of the court visits we've been through since that horrible night. Well, much of that came to an end yesterday. The thug who did this agreed to a plea bargain yesterday. He's going to be facing 20 years in jail, but at least we don't have to go to trial now. While the judge was explaining everything to him yesterday, he broke down and started to cry...at times, even bawling his eyes out. This was a radical change from the guy who used to stroll into the courtroom like he owned it, and it may sound horrible, but I was glad to see him cry. The DA had said that one of the victims was in the courtroom, and the only people in the courtroom other than the legal people who had to be there were me and Rebecca, and he kept looking at me, and I just kept starting back at him. Rebecca had herself hidden around a corner, so I'm not sure if he knew she was there or not. When he was being led back to jail, still crying, he turned, not really looking at me, but rather in looking in my direction, and yelled, "I'm sorry." He wasn't supposed to do that, but he did it anyway. Formal sentencing will be in October, and it will be at that time that Rebecca will have the opportunity to actually say something to him...if she wants. I think, no matter what, that she is going to write something, and even if she can't say it, she'll have the DA read it for her. The deputy DA who has worked on this case and the victim advocate have been wonderful. They've done everything they could to help Rebecca get through this, and I'm glad we've had them on our side. The e-book version of the 2012 issue of The Martian Wave is now available. You can find it in a wide variety of formats at https://www.smashwords.com/books/view/180655. I thought I'd give you a little tease of what you're missing if you haven't ordered your copy of the 2012 issue of The Martian Wave. To order your copy, go to http://sdpbookstore.com/tmw.htm. The storm chased them across the rock-strewn Martian surface. Relentlessly, as if to avenge some unprosecuted crime. This was the most powerful weather system Mars had experienced in nearly two centuries. It tore the rusty sand from the ground, marshaled it into an angry mass of iron oxide particles, then accelerated that mass to an insane velocity. And it was about to engulf them. "Welcome to the Newton Parts Exchange. What's your pleasure?" Captain Gerald Hatcher stood alone in the darkness of the clear plasteel dome, high above the rest of Moonbase Alpha, staring into the dark sky above the crater lip…waiting. Thom lifted his head from the pillow and regarded his new body with distaste. The chest and stomach were a washboard of carefully-shaped little muscles, which, in the grip of transfer nausea, resembled nothing so much as a field of tumors. The return of the fourth ship to head out to the edge of the galaxy was meant to be a celebration of two decades of achievement, but like the three previous ships to make the journey the return was not the joyous success the international space program had expected. The General had read all the brief during the construction of the ship, he didn’t understand the science but accepted the expert’s positions on the hyper drive and the gravity engine, he had signed off on the final test after all systems were passed, he had even congratulated each crew member personally before they departed. Now before him was the mess of failure. He’d written his resignation that morning and was ready to deliver it by hand to the President should he not find an answer to what had happened. All members of the crew were unconscious and the data on the ship’s computer systems was fast degrading. The Seastorm was still over 400 million miles out of Titan when the life support unit began to sputter.